Modern dentistry offers several great ways to permanently replace missing teeth, including high-tech dental implants and traditional fixed bridgework. But sometimes, for one reason or another, it isn’t possible to have these treatments done right away. If you need an aesthetic way to temporarily replace missing teeth, a flexible partial denture could be the answer you’re looking for. Certain kinds of removable partial dentures (RPDs) can be used as permanent tooth replacement systems, especially for people who aren’t candidates for dental implants or fixed bridges. But in the past, if you needed a temporary tooth replacement, one of the few alternatives was the type of rigid RPD often called a “flipper.” This consists of a firm, relatively thick acrylic base that supports one or more lifelike replacement teeth. It attaches to the “necks” of existing natural teeth via metal clasps, which gives it stability and strength. However, the same rigidity and thickness that gives these rigid RPDs their durability can make them uncomfortable to wear, while the acrylic material they are made of is capable of staining or breaking. Over time, the RPDs are prone to coming loose — and they are also easy to flip in and out with the tongue, which gives them their nickname. Flexible partial dentures, by contrast, are made of pliable polyamides (nylon-like plastics) that are thin, light and resistant to breakage. Instead of using metal wires to attach to the teeth, flexible RPDs are held securely in place by thin projections of their gum-colored bases, which fit tightly into the natural contours of the gumline. Their elasticity and light weight can make them more comfortable to wear. Plus, besides offering aesthetic replacements for missing teeth, their natural-looking bases can cover areas where gums have receded — making existing teeth look better as well. All RPDs must be removed regularly for thorough cleaning — but it’s especially important for flexible RPD wearers to practice excellent oral hygiene. That’s because the projections that hold them in place can also trap food particles and bacteria, which can cause decay. And, like most dentures, RPDs should never be worn overnight. Yet with proper care, flexible RPDs offer an inexpensive and aesthetic way to temporarily replace missing teeth. 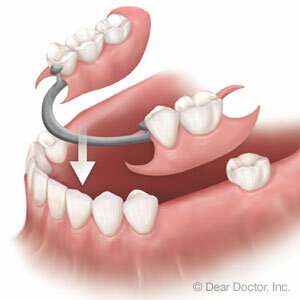 If you have questions about removable partial dentures, please contact us or schedule an appointment for a consultation.